Elite Parking has had another successful year servicing the valet parking needs for the Temple Beth Sholom in Miami Beach. Elite’s parking staff really shined during the Temple’s two largest events of the year; Rosh Hashana and Yom Kippur services, which had more than a thousand attendees. The Temple Beth Sholom is the oldest and largest and Reform Synagogue on Miami Beach, Florida, and currently has 1,210 member households. The new recently completed two-story facility includes a: Youth Center, Chapel, Welcome Center, offices, classrooms, meeting spaces and an art gallery. The Temple is also surrounded by outdoor spaces including a meditation garden, play areas and palm plaza. Elite Parking works to meet the needs of a variety of parking facilities, whether it’s a five-star hotel or a visitor/employee parking structure. They believe professional interactions with guests is vital to ensure the company’s goals are being upheld. Elite wants to congratulate Alex Rosa for receiving October’s employee of the month! 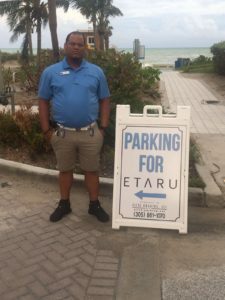 Rosa started working for Elite Parking a little over nine years ago and began his career as the parking manager of the Marea Condo and the South of 5th Garage. His hard work and dedication also assumed him the position as manager of Elite Parking’s newest account ETARU Restaurant – part of the ZUMA Group. As the manager of both properties, he handles all areas of operations including: managing parking facilities to client’s expectations, providing “white glove service” and building a great relationship with the property’s management and their residence. He also oversees the hiring of staff and provides on-site training, as well as payroll, tracking tickets and completing daily reports. Alex is a native of Dominican Republic, but relocated permanently to Miami with his family in 2003. When not at work, he likes to spend time with his wife and two kids, with a new addition to the family on the way. He began working in the parking industry in 2003 and brings an education and background in accounting. Alex looks forward to pursuing his career in parking management. Is “white glove service” a thing of the past? In the fast moving society that we live in today, the focus on customer service is slowly fading away. The friendly faces of bank tellers are being replaced with a computer monitor. Instead of getting our bill from a delightful waiter, we can push a few buttons on a tablet and settle our check ourselves. Is it really a convenience? Sometimes, but what if want to experience the true meaning behind “white glove service”? When we think of “white glove service’, it conjures up an image of grandeur, like the famous Plaza Hotel bellhops in New York City. We tend to think that the only people who should be polite, professional and attentive are anyone who wears a pair of white gloves. Unfortunately, the expectation of going above and beyond for a client or guest has fallen flat when it comes to industries such as valet service and parking. Once the term valet was synonymous with the highest caliber of service. Today many property managers and building associations are disenchanted with the decline of the traditional role valet attendants play in providing guests with 5-star service. Ruben Perez-Sanchez, a managing member at Elite Parking, noticed a decline in ‘white glove service” within the local parking industry. He saw the opportunity to build something better, a new wave of parking management when he joined the company. “We are dedicated to bringing back white glove service to the industry by putting in place employees that are well-trained and value our company’s core value,” said Perez-Sanchez. Elite Parking was founded and based in South Florida, and is a premier parking solution provider with a long history in Miami. 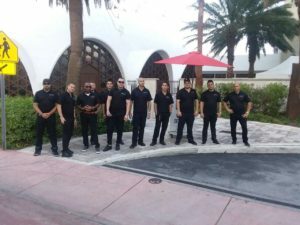 Elite was founded by Alfred Lariviere, a visionary in the Miami Beach parking and valet industry, and recently joined by Ruben Perez-Sanchez a technology entrepreneur. Both businessmen are Miami Beach natives and have seen South Beach evolve into the international paradise that it is today. “In the parking industry, especially in the luxury sector, people expect excellent service matched with discretion. Many of the residents who live in an ultra-luxury building expect complete unanimity,” said Perez-Sanchez. Elite Parking provides a formal employee training program upon hire, as well as monthly training meetings to assure their standards are met. The front line to providing great service many times resides in the proper training of employees who come into contact with residents and guests on a day-to-day basis. http://elite-parking.net/wp-content/uploads/2015/09/Elite-Parking-Logo.png 0 0 admin http://elite-parking.net/wp-content/uploads/2015/09/Elite-Parking-Logo.png admin2017-04-26 16:36:112017-04-26 16:36:35Is “white glove service” a thing of the past?